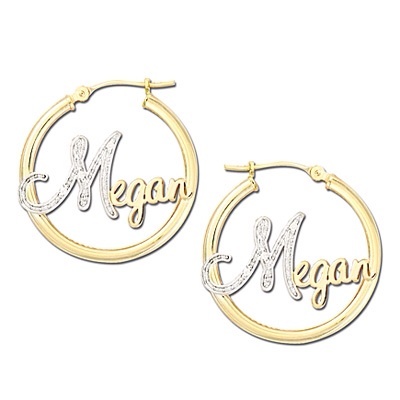 Diamond Accented Script Name Hoop Earrings in 14K Two-Tone Gold These 14K two-tone gold hoops earrings are 25mm in diameter and may be personalized with one script name (4-7 letters). The first letter of the name is accented with diamonds. This item is only available online. PRODUCT SPECIFICATIONS Stone Type	Diamond Diamond Total Weight (CT. T.W.) Diamond Accent Gold Karat	14K Height x Width	25.0 mm Metal Color	Yellow Metal Type	Gold Stone Color	White Typographic errors are subject to correction. Merchandise enlarged to show detail and may not always be exactly as pictured. Promotions, prices, styles and availability may vary by store and online.